The go to tracker for may HAB flights is the SPOT family of trackers; not only because of it’s low cost to operate but also because of it’s small size. In the past Iridium based satellite messengers and trackers have been large and heavy. For example, the 1st generation inReach tracker is 3 times as heavy as SPOT Messengers. With the availability of the Gsat Micro, from Gsat, size is no longer an issue. 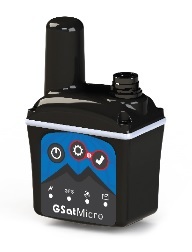 The GSatMicro is smallest self-contained Iridium tracker in the world. It transmits positions, SOS alerts and other specialized information through its industry-leading satellite antenna and electronics technology to be monitored and analyzed in real time. The Gsat Micro is small with it’s external dimensions of 45mm x 45mm x 34mm. It weighs a mere 127 which makes it just slightly heavier than the SPOT Messenger. The one thing that is large is the price tag though, coming in at $999; 9 times more expensive than the SPOT Gen 3. For now then SPOTs will still be the ‘go to’ tracker for HAB operators wanting to use satellite messengers but it is now clear that Iridium devices can be small enough to consider using.